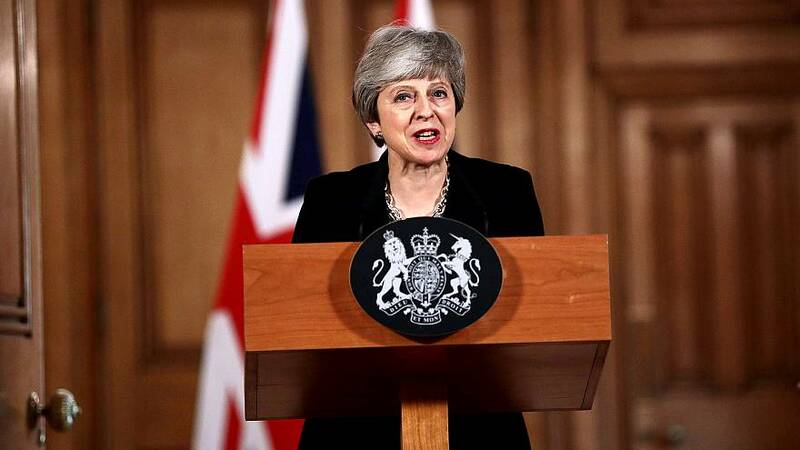 LONDON — Prime Minister Theresa May said Tuesday that she will seek to further delay Britain's exit from the European Union and seek to make an accord with the political opposition in a bid to break the Brexit impasse. May made the announcement after the E.U. 's chief negotiator warned that a chaotic and costly Brexit was likely in just 10 days unless Britain snapped out of the political crisis that has paralyzed the government and Parliament. After a seven-hour Cabinet meeting, May announced a significant softening of her Brexit terms. "I have always been clear that we could make a success of no-deal in the long term but leaving with a deal is the best solution," she said in a televised statement from 10 Downing St.
"So we will need a further extension of (the E.U. 's) Article 50 — one that is as short as possible and which ends when we pass a deal." May said "this debate, this division, cannot drag on much longer" and offered to sit down with opposition Labour Party leader Jeremy Corbyn in an attempt to find a compromise solution. Hours before May's statement, E.U. negotiator Michel Barnier offered E.U. legislators his downbeat assessment as British Cabinet ministers tried to thrash out a new proposal that the U.K. Parliament could consider following the defeat of the government's plan and a range of lawmaker-written alternatives. "As things stand now, the no-deal option looks likely. I have to tell you the truth," Barnier said in Brussels. "We can still hope to avoid it" if the intensive work in London produces a breakthrough before an April 10 EU summit. Britain could depart from the E.U. without a road map two days after the summit. The leaders of the EU's 27 remaining countries gave the U.K. until April 12 to leave the bloc or to come up with a new plan, after lawmakers thrice rejected an agreement struck between the bloc and May. The House of Commons on Monday threw out four alternatives to May's Brexit deal — the second day of inconclusive votes on options. May's statement seemed to indicate that she was veering away from the possibility of a no-deal Brexit. Exiting without a deal in place would jeopardize trade and travel, with new checks on borders and new regulations on dealings between the E.U. and Britain. Amid all the uncertainty, analysts have said the economic impact in Britain could be massive. Ford's European boss said that if the U.K. can't work out a deal on leaving the EU that guarantees "frictionless trade," the vehicle maker "will have to consider seriously the long-term future of our investments in the country." Ford of Europe Chairman Steven Armstrong told The Associated Press that "a no-deal Brexit would be a disaster for the automotive industry in the U.K."
Barnier warned that challenges remain for the E.U. too, though said the bloc is prepared for a chaotic exit. "Being prepared for no deal does not mean that there will be no disruption," he said. Barnier urged Britain's Parliament and government to take a more realistic approach as soon as possible. "We still have a little bit of patience," he said. French President Emmanuel Macron and Irish Prime Minister Leo Varadkar also made urgent appeals before May's statement for Britain to propose an alternative Brexit plan to avoid a no-deal departure. "We cannot spend the coming months on solving terms for the divorce," Macron said before he and Varadkar met in Paris. Varadkar stressed "there's still time" for May to come to the April 10 summit with "credible" proposals. The EU negotiated a long post-Brexit transition period with May. But it was linked to the overall agreement that hasn't won approval in Parliament, so "there is no transition if there is no deal," Barnier said. Barnier reiterated that the EU was unwilling to renegotiate the 585-page withdrawal agreement but said he would agree to open up the political declaration attached to the legal text. In Britain, political chaos continued to reign as the Cabinet held a marathon session to try to find a way out of the crisis. A group of pro-Brexit ministers pressed May to go forward with a no-deal departure. Other Cabinet members and a majority of lawmakers think that would be a disaster. Cooper has introduced legislation, which Parliament is set to consider, this week, that would require May to seek to extend the Brexit process beyond April 12 in order to prevent a no-deal departure.